One of my goals this year is to work on getting more healthy. I'd like to lose a bit of weight too, but that's not specifically my aim. I'd like to eat less processed food, make better choices and do more exercise. Exercise has always been a big issue for me. I'm not good at sport and I always hated PE at school. This really didn't set me up for a lifetime of good habits, actually apart from a couple of ill-fated attempts at going to a gym, I've pretty much ignored it. The problem was always that I couldn't actually do the tasks. At the gym, they'd say, 'then jog for ten minutes' TEN MINUTES! I had no clue how people did that. Finally I realised I needed to learn how to do exercise from a more basic level. In the same way you have to learn cooking. It's all well and good to have a recipe, but if you don't know what boil or whisk means? It's not going to work. 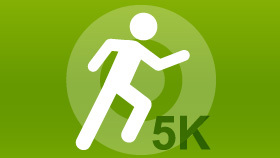 That's when I found this: NHS Couch to 5k plan. It's a series of podcasts which guide you from doing nothing to being able to jog 5k (about 3 miles) after nine weeks. It starts you off running for 60 seconds at a time. The first week I even found that difficult, but I quickly learnt that breathing in enough air is one of the most important elements. Getting out of breath, amongst other things, was why I couldn't do ten minutes on a treadmill. Each week the amount of running you do builds up, you run for a bit then walk for a bit to recover. The podcast tells you when to speed up and when you can slow down again. I can now run for 25 minutes in a row. I'll admit that it's taken much longer than nine weeks - some things got in the way. But I'm getting there. I really recommend you give it a go if you want to get moving, it's free to download, so what have you got to lose?